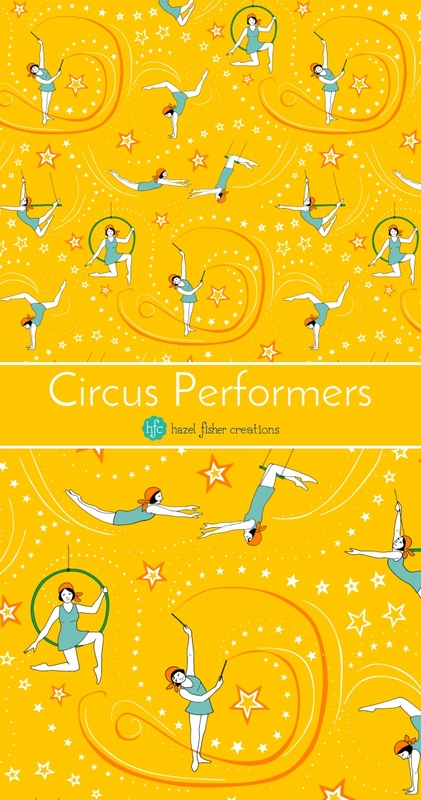 Continuing with the Circus theme, here is my entry to this week's Spoonflower design challenge; Circus Performers. My design features girls (inspired by 1920s fashion) performing acrobatics, gynastics (rhythmic ribbons!) and on the flying trapeze! This week's theme was the one I was most looking forward to designing for and I enjoyed drawing the girls - first in pencil then pen line drawing, which I scanned then coloured digitally. I added the stars, swirls and dots to give a sense of movement to the design. As with all of this month's circus challenges, there was a limited colour palette to use. The colours are probably not ones I would have chosen myself (yellow isn't a colour I usually use a lot of) but I actually like the yellow as a background for this and how the other colours work with it. Thank you if you voted for my Circus Performers design - it came 32nd (with 86 votes) out of 135 entries! You can see all the winners on Spoonflower here. This design is now available to buy from Spoonflower - you can find it in my shop here. Below is my entry to last week's challenge; Animal Alphabet Limited Colour Palette. 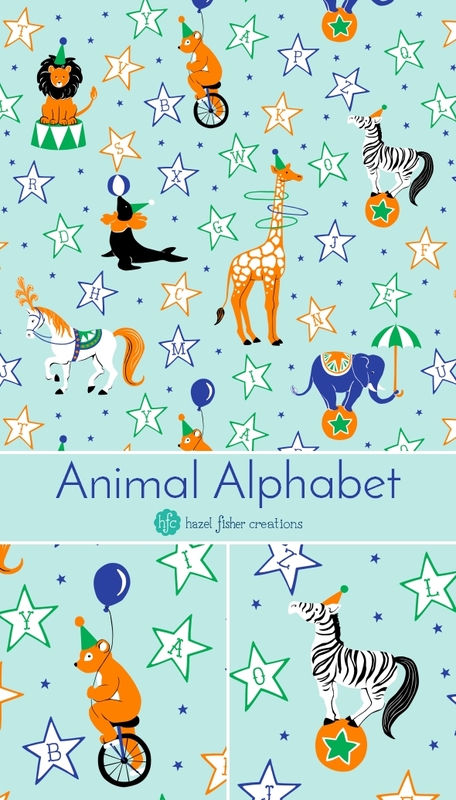 It features some of the animals I used in my first circus design, plus some new ones; a zebra, giraffe and bear on a unicycle!! The colour palette for this one was probably the most challenging for me - most of the animals were fine but I struggled to like any of the colours for the elephant. I'm looking forward to playing around with these a bit more after the challenges with some different colour combinations.